Thank you for visiting the Mt. Pleasant Super 8 website. When you are traveling in Mid-Michigan, we hope to see you along the way. The Mt. Pleasant Super 8 is a 100 Percent non-smoking hotel and the largest Super 8 in Michigan. The Super 8 has 140 rooms and is beautifully appointed, with much attention given to details and service to make your stay the best it can be. We want to keep you coming back each time you visit Mt. Pleasant. If business travel brings you to our area, the Mt. Pleasant Super 8 has all the amenities you need. We have free high speed wireless internet with a desk in your room as well as a free SuperStart breakfast, in room iron and ironing boards, in room coffee makers, free local calls, copy and fax service and a workout facility. Our knowledgeable staff can also help you get to wherever you need to go. The Super 8 Mt. Pleasant also features a newly renovated meeting room that can comfortably seat 60 banquet style and 50 classroom style. State of the art audio visual equipment is available. Let us help you plan your next reunion or meeting. Catering from Bennigans is also available. Conveniently located just off US 27, the Mt. 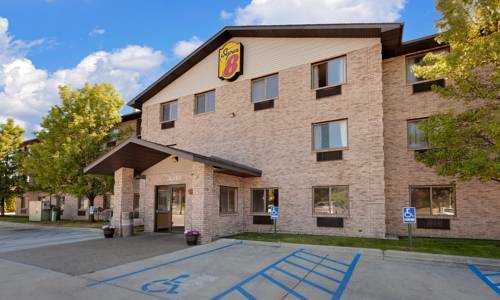 Pleasant Super 8 is just minutes away from the areas finest attractions. The beautiful Central Michigan University campus is just across the street and its never too early to book your room for CMU football games at Kelly-Shorts Stadium or basketball games at the newly renovated McGuirk Arena. The Soaring Eagle, the largest casino in the Midwest, is less than 5 miles away. We have great packages to test your luck at the casino and they include a shuttle service 5.00 per person round trip. Mt. Pleasant is also home to 14 great golf courses. We have packages available with each course so you can choose how to best test your skills. With great shopping in downtown Mt. Pleasant there is always something to do nearby. Pets Allowed - 20.00 per night, per room.